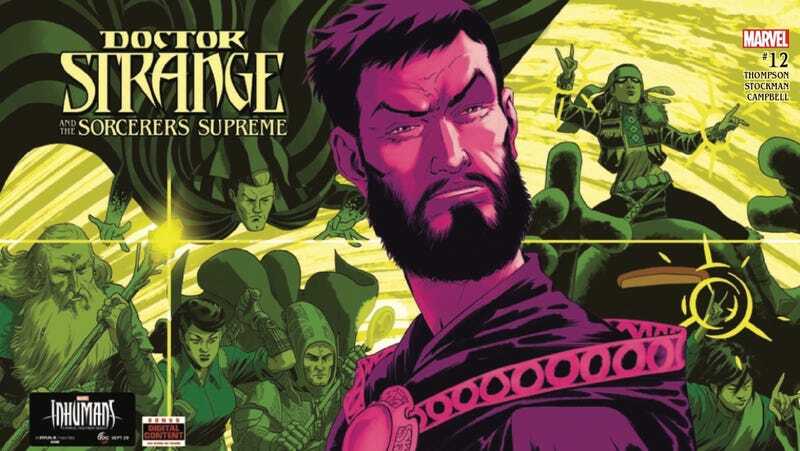 Marvel’s Doctor Strange And The Sorcerers Supreme has consistently experimented with visual storytelling, making it one of the most imaginative superhero comics of the past year. The main art team of penciler Javier Rodriguez, inker Álvaro López, and colorist Jordie Bellaire took advantage of the book’s magical foundation to play around with layouts, rendering styles, and palettes, and writer Robbie Thompson crafted scripts that gave them the freedom to try new things and discover how that enriched the story. The artwork has been incredible, but it’s also been paired with captivating character dynamics, and after 11 issues, Thompson has built a superhero team where the members genuinely care for each other (with the exception of Isaac Newton, who only cares about himself). Doctor Strange And The Sorcerers Supreme wraps up with next week’s issue #12, but it’s going out with a bang. Continuing with the theme of breaking the superhero norm, the entire issue is presented in “widescreen” with the staples on the horizontal axis. This gives the artwork a grandiosity that works very well for the conclusion of a story that has sent the sorcerers throughout time and space to save the universe. Artist Nathan Stockman has been more than just a fill-in on this series, and his crisp, finely detailed artwork has kept the quality of the visuals high after the departure of Rodriguez, López, and Bellaire. This exclusive preview of Doctor Strange And The Sorcerers Supreme #12 highlights the care Stockman puts into his compositions and character work, and he’s using the widescreen format to heighten the scope of his art. The most powerful page in this preview is a cutaway showing Merlin making his way through Doctor Strange’s Sanctum Sanctorum, and Stockman’s highly specific linework draws the reader deep into this location. This is just a page of Merlin walking through a house, but it’s presented with a striking layout that makes this tour feel dramatic and important. Colorist Jim Campbell gives the Sanctum Sanctorum a dingy atmosphere, and Joe Caramagna’s lettering guides the reader through the complex, twisting layout. It’s sad that this series is ending when it’s at such a creative high, but hopefully Marvel will collect it all in one big collection so readers can experience the visual splendor in a complete package.